I don't do a ton of Halloween cards each year. I just don't have much purpose for them, although I love to create them. The shapes, colours and textures are all so much fun, so I have to do some of them for my own sake. This card was one of them. It gave me a chance to use my new Ghoulish Grunge stamp set that I've been dying to get my hands on and ink up! What fun that was! And then there is the Jar of Haunts stamp set that coordinates with the Everyday Jars Framelits! Great images! Finally, I just got a hold of the Halloween Scenes Edgelits as well and put them to work. I had a great time playing with all of them! I might have gotten a titch carried away with all the Ghoulish Grunge texture, but it's so gorgeous and I stamped most of it in Smoky Slate on top of Smoky Slate cardstock so it's not overpowering! Aren't they great textures? I love the texture on the little mummy jar from Jar of Haunts! 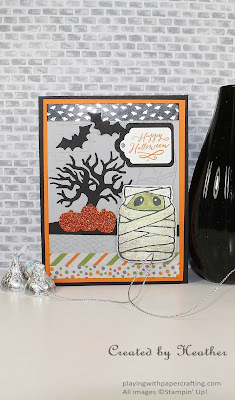 He comes with just the lines, but I used the gauze texture stamp from the Ghoulish Grunge set and some Pear Pizzazz ink to add the gauze texture to the mummy wrappings. To add some dirt to them, I used one of the edges stamps from Timeless Textures and some Smoky Slate ink, stamped off, to add a little grime to the edges of the jar. I die cut him with the Everyday Jars framelits. 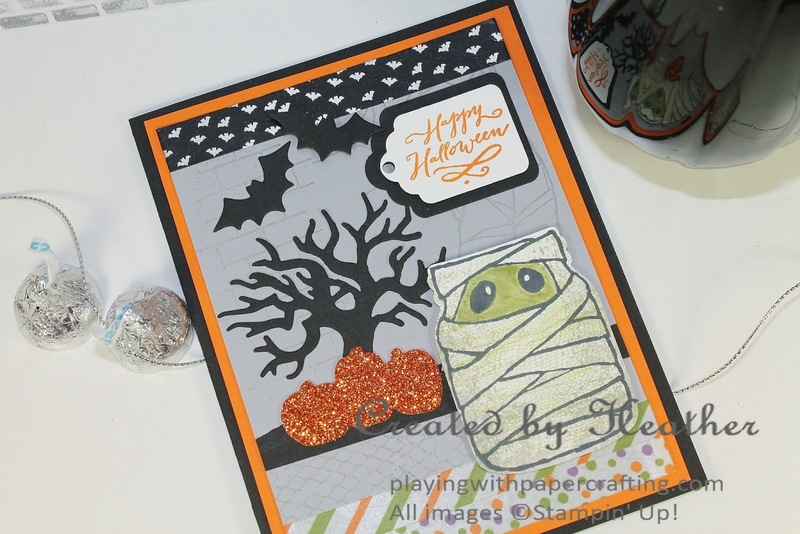 The Halloween Night Washi Tape adds a bit of a frame top and bottom of the panel. And the new Pumpkin Pie Glimmer paper is great as an eye popper for a trio of pumpkins underneath the old dead tree, made with the Halloween Scenes Edgelits, which die cut the bats as well. The sentiment is also from Jar of Haunts and is die cut with the Tags and Labels Framelits. 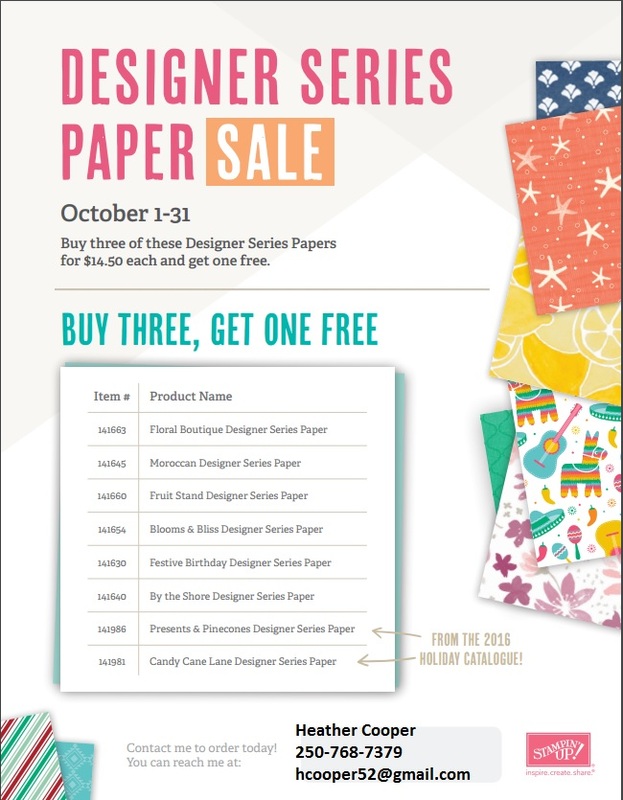 Don't forget about the Buy Three, Get One Free Designer Series Paper Promotion on from now until October 31! 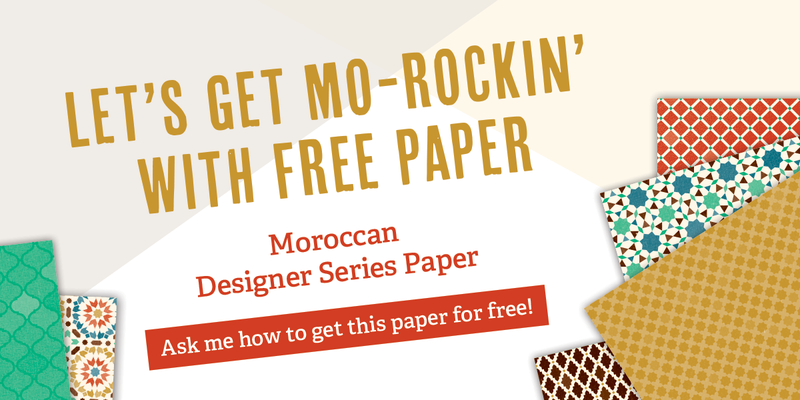 The details are below! It's a great time to stock up though! Learn to Make an Illuminated Easel Shaker Card! Oh, What Fun with Swirly Scribbles!